It depends primarily on your motivation for writing.If you are motivated by profit, changes are you are running a business. If, instead you are motivated by love or passion for writing and don;t care if you make money, then you are probably a hobby writer. By the way, the Tax Cut and Jobs Act passed in late 2017 made being a hobby writer harder on your taxes! Congress eliminated itemized deductions (subject to 2% of your Adjusted Gross Income) which is where most hobby expenses were deducted. No more tax deductions for hobby expenses. That’s why you may want to consider your writing as a business if you receive any income from writing! The time and effort you spend on writing: Spending significant amounts of time writing might imply that your writing is more than a hobby and it is a business. If you conduct business activities such as doing some advertising or record keeping may mean your hobby has become a business. Your expertise and prior success in a similar activity makes you appear to be a business. An author with a publishing contract has a business, not a hobby. Your profit motive and prior history of profits may indicate a for-profit business, not a hobby. Still can’t figure it out? 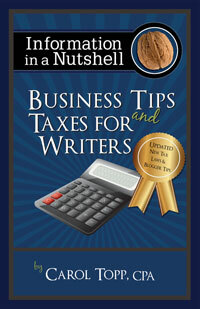 My book Business Tips and Taxes for Writers devotes a chapter to hobby writing, its advantages and disadvantages. It’s been updated to include the most recent tax law changes. Business Tip #14 for Writers: Writing – Business or Hobby? Is hobby income from writing taxable?